There have always been elements of traditional Mexican music in the songs of Y La Bamba. They’re frequently wrapped in a folky indie-pop package that’s practically shorthand for Portland, Oregon, the band’s hometown. This time around, mastermind Luz Elena Mendoza peels away much of that accompaniment—the luminous guitars and lush synths—in favor of a more rhythmic approach that gives this album a sharper edge. No wonder: Y La Bamba’s fifth LP is informed by Mendoza’s experience as a Mexican-American woman at a time when that experience can seem like a radical statement of self. Mujeres (Spanish for “women”) is, at heart, a musical accounting of Mendoza’s search for identity. 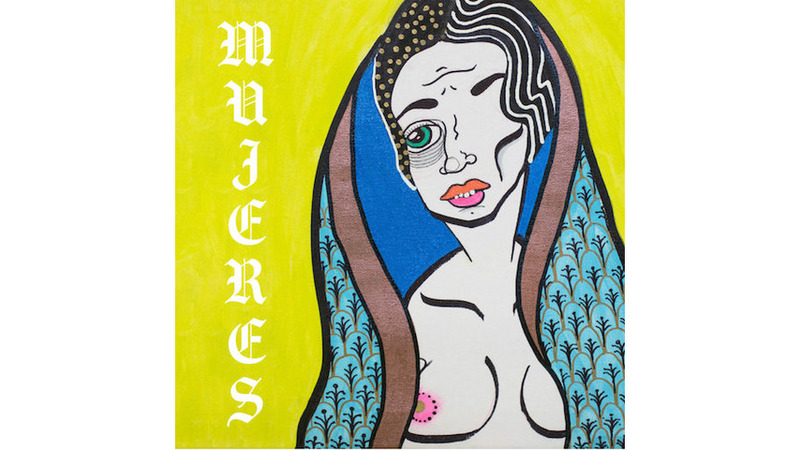 There’s still plenty of musical texture in the 13 new songs (and one riotous digital bonus track) on Mujeres. Mendoza sings in a mix of English and Spanish, repeating phrases in a rhythmic, staccato way that becomes hypnotic on “Conocidos,” and almost confrontational on the title track, where her voice is layered over clattering polyrhythms. Opener “My Death” hews closest to the indie-rock sound the band honed on previous albums, with airy guitars circling around an unhurried, deep-pocket beat as Mendoza lets her voice float and flutter through the musical arrangement. Many of the other songs employ variations on the Mexican folk rhythms she has absorbed since childhood: the beat flows swiftly on the busy “Bruja de Brujas,” and pulses gently on “Cuatro Crazy” beneath an effects-treated guitar so bright it’s almost brittle. The bonus track, “De Lejos,” lays electric-mariachi guitar riffs over a busy percussion bed, and tops it with terse, alluring vocals that add even greater rhythmic dimensions to the song. Even as she’s searching for her place in a broader cultural context, Mendoza is creating her own. She embraces her heritage without letting it bind her, while blending the disparate worlds of indie-rock and Mexican folk music into a vibrant and distinctive sound all her own—one that makes Mujeres Y La Bamba’s most uncompromising album. Given her willingness to challenge what makes her uncomfortable, and to channel her discomfort into music at once pointed and alluring, it’s also the group’s most compelling work yet.